This is a very special Flashback Friday. and JoAnna Carl has dropped by for a visit. That’s because I think research is truly important to the mystery story, and because I always have fun doing it. Especially doing research about chocolate. The part about research being important to the mystery story is easy to see. If the clues and the background in a mystery are not accurate, the whole thing becomes unbelievable, and nobody wants to read it. The part about research being fun results from of my usual method of finding things out. I just ask somebody. I find somebody who knows and ask them. Talking to people is always fun. I’ve never had anybody refuse to answer a question. I’ll admit that I often pick the subjects for clues in my books because I know someone who will help me out. This research method led to the creation of the Chocoholic books. An editor asked me to write a proposal for a cozy, and the coziest background I could think of was chocolate. Besides, I just happened to have a daughter who was working for a chocolate company. Duh? Who else can you call at ten o’clock at night and ask the melting point of chocolate? The editor also liked the idea. Then one problem arose. The Chocoholic books were classified as “Culinary” mysteries, and Culinary mysteries usually have recipes. But my editor and I thought the type of high quality chocolate in the books was not ideal for the typical household cook. The editor suggested “Lore” instead – interesting facts about chocolate. So for Lore research I found I had to read books. I didn’t mind that. It gives me an excuse to learn about one of my favorite topics: chocolate. Its history and science are fascinating. The Spanish explored the New World looking for gold, for example, but chocolate may have eventually been a more valuable find. Of course, in those days the chocolate bar had not been invented. Chocolate was only a drink. One tale that I find interesting is that in Spain young women began to have their maids bring them chocolate during mass, since drinking it was recommended to fight feelings of weakness. (We all know how weak a young girl can feel in church.) When a priest who opposed this practice died under mysterious circumstances, scandal ensued. Now there’s a motive I definitely couldn’t think of on my own. And for years churchmen argued over whether chocolate was a food or a drink. Could it be drunk during Lent? Another religious group involved with chocolate was the Quakers. A bunch of English businessmen, all Quakers, supported early efforts to mechanize the manufacture of chocolate and were prominent in its manufacture and sale. They demanded a high moral code for their industry, even insisting on good treatment for workers in the tropical countries where chocolate was grown. Today’s Fair Trade movement probably thinks it came up with something new, but those Quaker businessmen had the same basic idea. In England, one of the group, Cadbury’s, even established a model town to house its workers. Interestingly, Milton Hershey did the same thing during the next century in Pennsylvania. Who would have thought that chocolate could be linked to a social conscience? A lot of the people of chocolate history are fascinating, from the Marquis de Sade to Forrest Mars. Cardinal Richelieu is even sometimes given credit for introducing chocolate to France. Yes, that was the guy who according to the novelist Dumas gave so much trouble to Anne of Austria and the Three Musketeers. The cardinal supposedly drank chocolate for medicinal reasons. The science of chocolate has an interesting history as well. For several centuries chocolate was promoted as a medicine or an aid to good health. Even today chocolate has been cited as being good for lowering blood pressure, for example. As for the sugar that often accompanies chocolate – well, it gets a different report. Joe and Teresa Graedon, who write The Peoples Pharmacy column carried by many newspapers, offer a pamphlet on the health benefits and threats of chocolate – including recipes – that even a scientific dummy like me can understand. For the history of chocolate my main source is The True History of Chocolate by Sophie D. Coe and Michael D. Coe. But researching chocolate is fascinating to me, and not just because I’m an absolute freak for the stuff. Writing about it gives me a built-in excuse to visit any chocolate shop I pass. There’s the one in Washington D.C. where I first saw chocolate-covered bacon. There’s the chocolate garden in Michigan, with chocolate-colored plants. There’s the store in Lawton, Oklahoma, that stocks every kind of old-fashioned chocolate bar. And I get a specialty catalog that even offers Walnettos. You have to be old – like me – to remember Walnettos. They’re not chocolate, but still good. And they take me right back to my childhood. I may have to quit writing and go buy myself a Cherry Mash. Thank you JoAnna for visiting today! I reviewed the hardcover version of this book last year. The approach of Easter means a rush of business at TenHuis Chocolade, and Lee and her Aunt Nettie need all the help they can get to make their famous chocolate bunnies. Unfortunately, new hire Bunny Birdsong is a clutzy basketcase dropping everything she picks up. But to Lee’s surprise, she’s a whiz with computers and fixing the store’s website so they decide to keep her. It’s all about the BUNNIES! TenHuis Chocolade is getting ready for Easter with plenty of bunnies on order. The also have a Bunny on the staff, Bunny Birdsong. She seems to be an accident looking for a place to happen, but she does have her talents and Lee finally finds out what those are. Both are surprised when her ex’s aunt shows up at the shop, soon followed by the ex himself with his new girlfriend. A little drama in the sales area that Lee quickly tries to handle. When the aunt becomes the latest murder victim in Warner Pier it isn’t good for “anybunny”. Disruption in the shop has everyone on edge and Bunny on the top of the suspect list means Lee has a basket full of trouble. She is hopping into the investigation to find the real killer so everyone can get back to making all those tasty holiday chocolates we all love. This is a perfect “EGGSCAPE”. My senses skipped right over Christmas to spring and Easter the minute I started reading. The expansion of TenHuis Chocolade continues with just a little pause for the police to collect their evidence. Lee and her Aunt Nettie are doing their best to keep all the workers and employees focused on their jobs while they and Police Chief Hogan focus on the murder. JoAnna Carl’s stories never disappoint. I jump right in and they brighten my day. 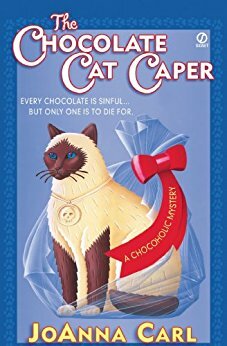 I love the characters, I love the setting and I love the chocolate! Don’t let the number of pages in this book fool you. It is a fantastic cozy mystery that will have you laughing out loud and then on the edge of your seat. So well written and plotted precisely, it has an excellent flow. Family, romance, humor, mystery, everything in the right proportions. Ms. Carl tells a top-notch story. I also enjoy the trivia she includes throughout the book. Think this series is too far along to jump into, it’s not. The author gives you enough detail without revealing or spoiling anything from previous books in the series. Try one and you are going to want to read them all. You just may want to have some chocolate in the house because this book will have you craving a truffle or 2. 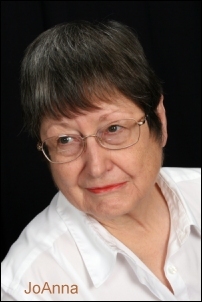 To find out more about JoAnna Carl visit her webpage here. Thank to the publisher I have 1 copy to give away! 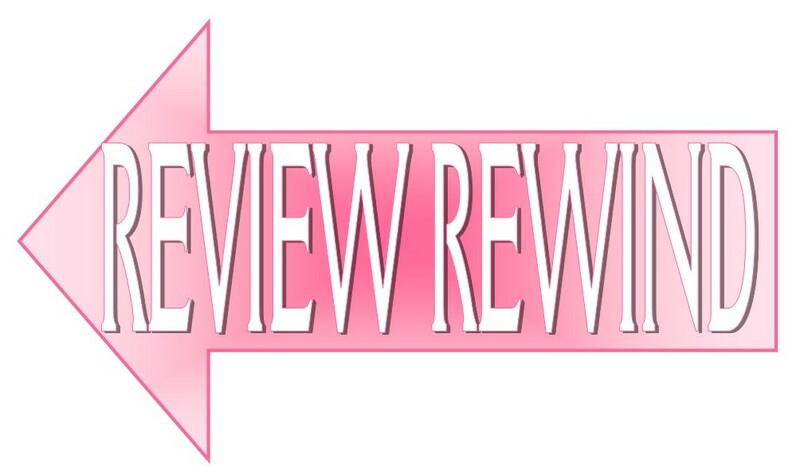 Leave a comment for JoAnna and earn 5 Bonus Entries! 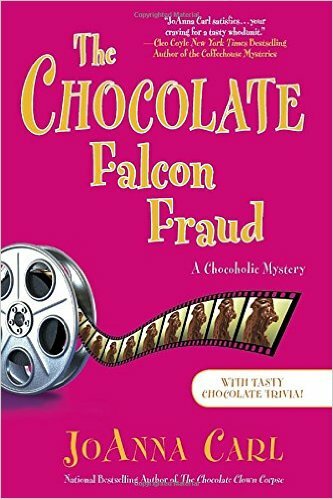 Looks like a fun chocolatiering mystery! This sounds great–I’d love to read it! This is one of my favorite series. I like the setting of the books, a chocolate shop in southwestern Michigan, a great place for a chocolate shop. I’ll gladly volunteer as a chocolate research assistant, should JoAnna need one. This sounds like a fun series.